“No, I like to hear them sing,” my mother said. What my aunt didn’t realize was that my mother sang, too. Sometimes she sat in her rocker and hummed contentedly in perfect harmony with the rest of the family. As the song leader of our little country church, one of my dad’s favorite Bible verses was Ephesians 5:19: “sing and make music in your heart to the Lord” (NIV84). He took that passage literally, and the melody that came from his heart was sung joyfully in a clear tenor voice. My parents’ home was at the edge of the woods. Late in the summer evenings we sat in the backyard and looked across the field of wildflowers toward my grandmother’s house. We listened to the musical rustling of the trees, the singing of the night birds and sometimes we sang. The psalmist said, “Let the fields be jubilant, and everything in them. Then all the trees of the forest will sing for joy; they will sing before the Lord, for he comes” (Psalm 96:12). Some people radiate joy naturally and spontaneously until it becomes contagious. So it was with Pollyanna, one of my favorite fictional characters from elementary school. The book, Pollyanna, a story about a young orphan girl, was written by Eleanor H. Porter. Pollyanna went to live with her Aunt Polly and became known as the girl who found joy in every situation. Her cheerful manner and joyful attitude changed the entire community. When President Eisenhower made a casual comment about someone having a Pollyanna attitude, the media made a big deal about it. I was amazed that more people didn’t remember who Pollyanna was or know about her gladness. Her joyful manner made an indelible impression on me! Once, after he had passed by, I found myself singing that song, too. It was like a relay game where someone started a song and passed it from one person to another. I wonder how many people have been touched by one song. It reminded me of tossing a pebble into the water and seeing the widening circle of ripples. Where would they stop? When the leader invited everyone back for the next devotional, gray-haired granny replied, “I’ll be here; I never miss.” What an inspiration, a joy and a blessing! One Sunday before worship service, it was a challenge for the song director to overcome the joyful noise of people talking, laughing and greeting each other long enough to begin worship. His solution was to sing, sing and sing while everyone found their pews. The joyful noise of talking and laughing quickly turned into the joyful noise of praise through singing. At times I have found myself singing hymns that I had heard in worship service the day before. The songs carried themselves from one day to another as a continuous praise. Philippians 4:4 tells us to rejoice in the Lord always with such emphasis that the writer repeats himself: “I will say it again: Rejoice!” (niv84). When I hear the familiar hymn, “Shall We Gather at the River,” a smile comes to my face as I recognize the tune my daughter used daily when she led her son to the bathroom. It began, “Let’s go tee tee on the potty …” I hope that Robert Lowry, the author of that sacred song written in 1864, would not be offended if he were here. I think he might also smile, and I doubt that I will ever be able to sing that hymn again without the corners of my mouth turning upward. Where there’s a room filled with singing, there’s a room filled with joy. If ever there has been a more joyful group than a singing bunch of young children, I can’t imagine who they might have been. I have seen exuberant elementary children in Vacation Bible School sing, clap their hands, and bounce as they added motions to their songs in joy and fun. Their expressions reflected their joyous hearts. Contagious joy has been experienced in many ways. The psalmist recognized it in God’s creation as he wrote: “Let the heavens rejoice, let the earth be glad; let the sea resound, and all that is in it” (Psalm 96:11). When I first saw the ocean and ran along the sandy beach, it was an exhilarating and joyful moment. My friends and I raced into the water as laughter bounced from one to the other. What a surprise when the noisy waves splashed the beach and toppled me over. Drenched and tasting the saltiness of the water, I hadn’t meant to get my face wet. I was 18, and it was the first time I had experienced the ocean, that wonderful part of God’s creation. It was a day filled with joy. I remember the joy of rocking and singing to my babies before naptime or bedtime. Two were cuddled in my lap while one hung onto the arm of the rocking chair. I soothed and quieted them with lullabies and love. So it was with God as recorded in Zephaniah 4:17: “The Lord your God is with you … He will take great delight in you, he will quiet you with his love, he will rejoice over you with singing.” In return, God intended for us to sing to Him joyfully. 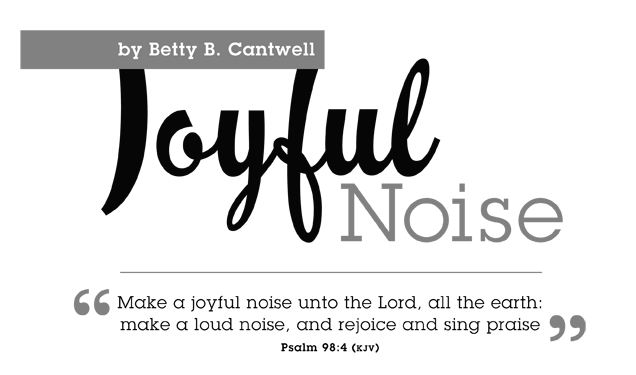 Betty B. Cantwell is a retired art teacher living in Arlington, Texas, where she worships with the Park Row Church of Christ. Betty enjoys painting, pottery, sewing and genealogical research. Some of her writing has been published by Guideposts Books.